Hostal el jardin is located in the city of Leon where you can walk from the bus terminal that is only 6 blocks and ten minutes walk from the cathedral feet, near market, shops , supermarket, bus terminal. 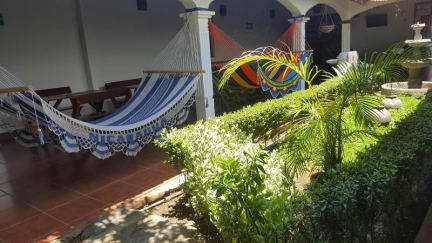 Hostal el jardin has 5 types of rooms: double room with queen bed for two and a private bathroom; twin room with two twin beds and with private bathroom; triple rooms with three beds and private bathroom; quadruple room that can accommodate four people with two bunk beds with private bathroom; mixed dorm for men and women with shared bathroom ( one bathroom for men and one for women only ). 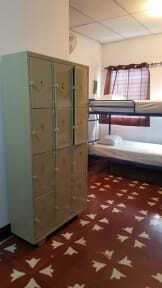 Every room has a fan and very comfortable beds. Moreover we have a wonderful garden in the back of the hostel where you can feel the fresh air and singing the birds in the morning, perfect for a good cup of coffee, especially an excellent view to watch the sunset . We offer shuttle service, laundry, city tour , tour of volcanos ( Cerro Telica & Black ) , rental bike , tour bike to the beach , all at an affordable price. Payment upon arrival by cash, credit cards (This property may pre-authorize your card before arrival). I will write full review later! Thank you so much. Great helpful staff at the reception! Breakfast is really small, so buy extra food. It is very clean. But it would be nice, if the cleaners didn't clean during breakfast - It was a harsh chemical smell. Good local restaurants are a 10 min walk from the hostel. But great stay. Good Relaxing stay! Great friendly staff very helpful and fun ! good place to relax and easy to meet other travelers! Stayed in a double private room. Was good for the price. Wasn’t dirty but the whole place is grubby and could do with a tidy up. Probably wouldn’t use the kitchen here. Really chilled atmosphere, nice hammocks etc to hang in. Not very social if that’s what you’re looking for. About 5 mins walk into the centre of town but some cool cafes and bars etc close by / on the way. Organised volcano boarding through the hostel and got a free shuttle to las penitas and back the next day for $26. Decent hostel. Quiet which was nice, great priced hostel for a private room with ensuite. Breakfast was a bonus, very delicious :) great place to stay for a good night's sleep for sure! The dorm room I stayed in had no door, just a curtain and it was connected to the main area so it was very noisy in the morning. There were also not enough outlets for people to charge their phones. The breakfast was very basic and they didn’t even provide any condiments. One of the staff members told my friend and I it was safe to walk around at night but as soon as we left we were catcalled about 5 times within just a couple minutes...the location felt very unsafe.